TARRC successfully exhibited at AAPEX 2015, at the Sands Expo Center, Las Vegas, Nevada from 3rd - 5th November 2015. 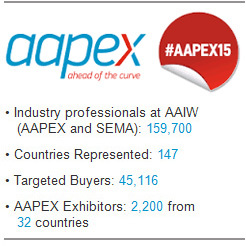 The Automotive Aftermarket Products Expo (AAPEX) was rebranded in 2015 subtitled 'Ahead of the Curve' and it proved beneficial as the 2015 Expo was the most successful yet, for both TARRC and the overall event itself. As a regular fixture in TARRC's exhibition calendar our booth was positioned ideally on the Lobby Level Exhibit Hall, booth 8542 and was well placed on the corner of the Auto International section, for AIA members only, near the main entrance. This great location was ideal for a constant flow of traffic of visitors and potential new customers. TARRC's Gail Reader, who manned the stand along with David Cawthra, said "AAPEX is now in its 23rd year in Las Vegas and the sold out event attracts visitors and exhibitors from all over the world. " Gail continued, "As the trade statistics show, imports to the USA of Malaysian rubber automotive products have been increasing steadily over the past five years paricularly in certain product sectors such as hose. We were very pleased this year with the broad range of products that visitors to the booth were looking to source and we are confident that the Malaysian rubber industry with TARRC's assistance will be able to provide competitive quotations." These exhibitions are a great way to spread the word about the manufacturing industry out in Malaysia and the opportunities provided to the North American market. It's also a great PR platform for TARRC, the Malaysian product manufacturers and the country. If you are looking to source high quality, competitively-priced rubber-based products and were unable to make it to the exhibition, then just let us know and we can send you a FREE 2015/2016 Directory of Malaysian automotive product exporters of parts, components & accessories.